There is an incredible card at the Spa, but there are some sweet plays on the undercard that just may get you going to build your daily bankroll. J.J Castellano in the saddle for Todd Pletcher (28%). They are ITM 67% as a team, and the rider is hot. He loves to win at 22% on the greensward, and they switch from Pletcher’s #2 man DeCarlo to Castellano. A bullet work on 8/27 going 47 flat, signals ready to fire. 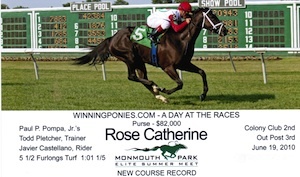 Also, Rose Catherine was the winner of the WinningPonies – Day at the Races event at Monmouth back in June. Ramon Dominguez has the call for Carl Domino. They are 1/1 at Saratoga ITM, and exits a second time back off the layoff angle. Add in a beaten favorite swing, and Domino scores at 26%. Goes from a mile to a 1 1/16, and this 3-yr-colt should show up to fire nicely. Dominguez rolls at a crisp 21% on the grass.